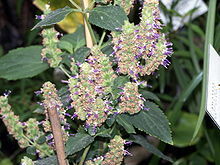 Patchouli[note 1] (Pogostemon cablin) is a species of plant from the family Lamiaceae, commonly called the "mint" or "deadnettle" family. The plant grows as a bushy herb, with erect stems reaching around 75 centimetres (2.5 ft) in height and bearing small, pale pink-white flowers. It is native to tropical regions of Asia, and is now extensively cultivated in China, Indonesia, Japan, Cambodia, Myanmar, India, Maldives, Malaysia, Mauritius, Seychelles, Madagascar, Taiwan, the Philippines, Thailand, Vietnam, South America and the Caribbean. The heavy and strong scent of patchouli has been used for centuries in perfumes and, more recently, in incense, insect repellents, and alternative medicines. The word derives from the Tamil patchai (Tamil: பச்சை) (green), ellai (Tamil: இலை) (leaf). In Assamese it is known as xukloti. In Kannada it is known as Pachhethene. Extraction of patchouli's essential oil is by steam distillation of the dried leaves, requiring rupture of its cell walls by steam scalding, light fermentation, or drying. 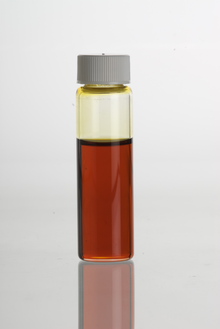 The main chemical component of patchouli oil is patchoulol, a sesquiterpene alcohol. ^ "Extraction of Patchouli Essential Oil by Steam Distillation Process". Sumatrans Patchouli Essential Oil. Archived from the original on 2 October 2016. ^ Hasegawa, Yoshihiro; Tajima, Katsuhiko; Toi, Nao; Sugimura, Yukio (1992). "An additional constituent occurring in the oil from a patchouli cultivar". Flavour and Fragrance Journal. 7 (6): 333–335. doi:10.1002/ffj.2730070608. ISSN 0882-5734. ^ Weyerstahl, Peter; Gansau, Christian; Marschall, Helga (1993). "Structure–odour correlation. Part XVIII.1 Partial structures of patchoulol with bicyclo[2.2.2]octane skeleton". Flavour and Fragrance Journal. 8 (6): 297–306. doi:10.1002/ffj.2730080603. ISSN 0882-5734. ^ Hybertson, Brooks M. (2007). "Solubility of the sesquiterpene alcohol patchoulol in supercritical carbon dioxide". Journal of Chemical & Engineering Data. 52 (1): 235–238. doi:10.1021/je060358w. PMC 2677825. PMID 19424449. ^ a b Nikiforov, Alexej et. al; Jirovetz, Leopold; Buchbauer, Gerhard; Raverdino, Vittorio (1988). "GC-FTIR and GC-MS in odour analysis of essential oils". Microchimica Acta. 95 (1–6): 193–198. doi:10.1007/BF01349751. ^ a b "What is Patchouli?". wisegeek.com. ^ Trongtokit, Yuwadee; Rongsriyam, Yupha; Komalamisra, Narumon; Apiwathnasorn, Chamnarn (2005). "Comparative repellency of 38 essential oils against mosquito bites". Phytotherapy Research. 19 (4): 303–309. doi:10.1002/ptr.1637. PMID 16041723. ^ Zhu, Betty C.-R.; Henderson, Gregg; Yu, Ying; Laine, Roger A. (2003). "Toxicity and Repellency of Patchouli Oil and Patchouli Alcohol against Formosan Subterranean TermitesCoptotermes formosanusShiraki (Isoptera: Rhinotermitidae)". Journal of Agricultural and Food Chemistry. 51 (16): 4585–4588. doi:10.1021/jf0301495. ISSN 0021-8561. PMID 14705881. ^ also spelled "patchouly" or "pachouli"
This page was last edited on 17 April 2019, at 08:24 (UTC).